All nine pieces in the Constructed Series finally finished. 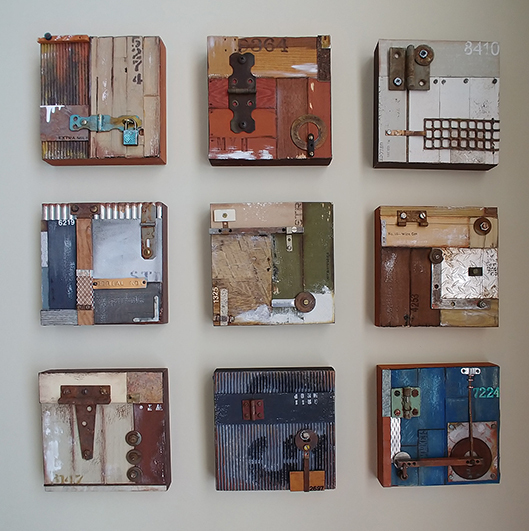 Each piece is 6″ x 6″ and made from found items and building samples on cradle boards. The “Constructed” series continues with this mixed-media collage assemblages that are made from a vast collection of building supply samples and found hardware. This piece includes vinyl flooring, stained wood samples, laminate samples and hardware. 6″ x 6″ on wood cradle board. Continuing the “Constructed” series of mixed-media collage assemblages that are made from found items and building supply samples. 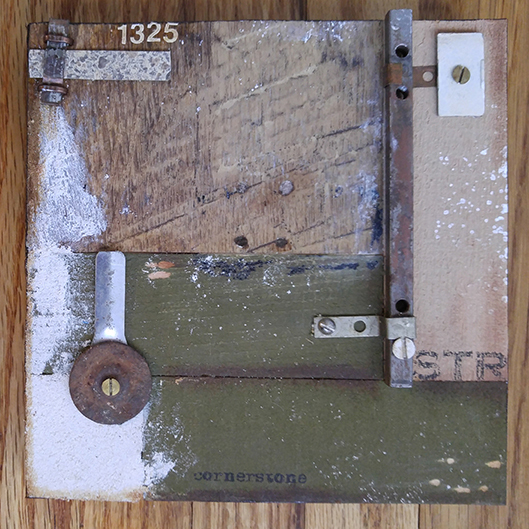 This piece includes stain samples on wood chips, a brass hinge and lock, a laminate sample and other found pieces on corrugated painted paper. 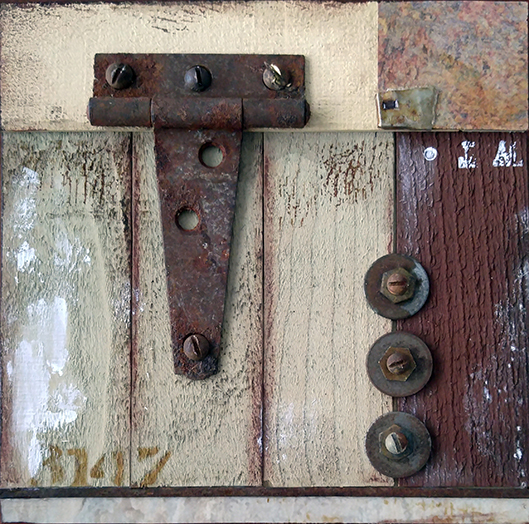 Part of the “Constructed” series, this piece is a mixed-media collage assemblage that combines rusty metal pieces with building supply sample pieces. It includes stain samples on wood chips, a rusty hinge and washer, a piece of laminate sample, screws, paint and ink. 6″ x 6″ on wood cradled board. 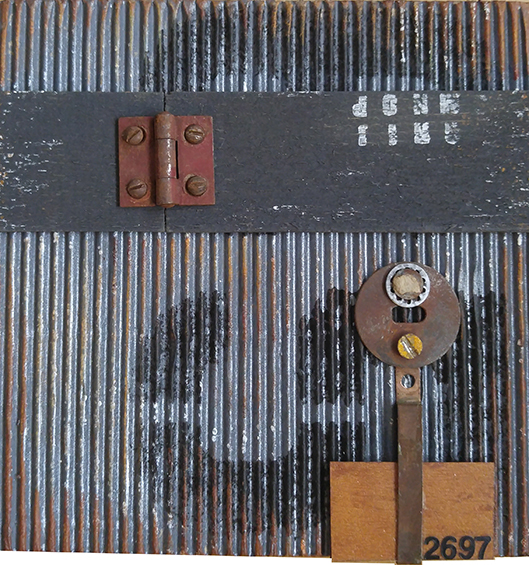 This piece is the third mixed-media collage assemblage in the “Constructed” series that combines my hoard of rusty metal pieces and building supply samples together. This piece includes stain samples on wood chips, a laminate sample piece, a flooring sample piece, a rusty hinge, nails, screws, and other rusty finds. 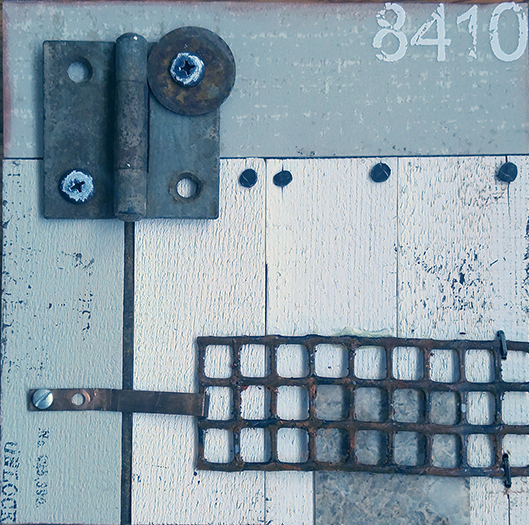 This mixed-media collage assemblage continues the “Constructed” series of pieces inspired by rusty metal and building supply samples. 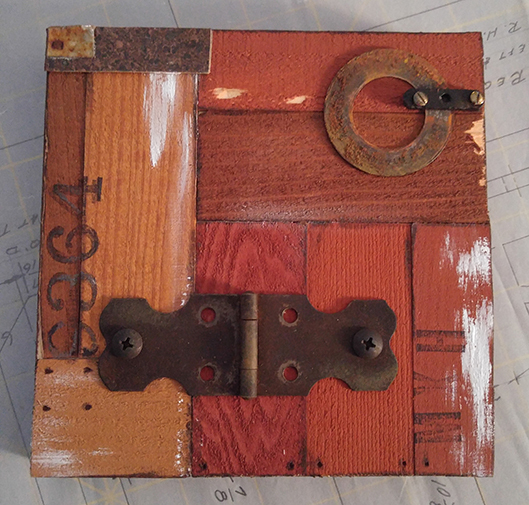 This piece includes stain samples on wood chips, a laminate sample piece, corrugated painted paper, rusty hinge and other found metal pieces. 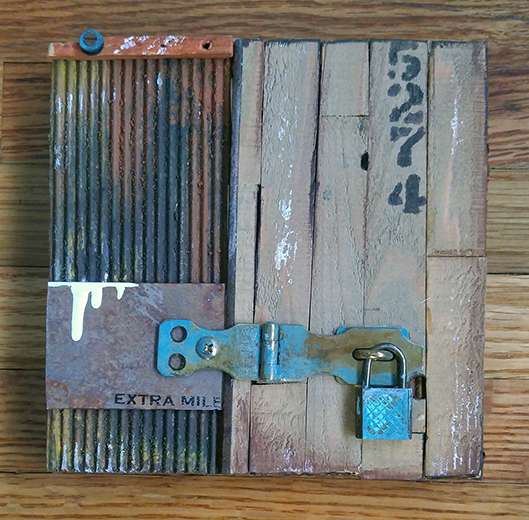 This is the first in a series of mixed-media collage assemblages inspired by my hoarded collection of rusty hinges, metal washers and building supply samples. Using power tools instead of glue and hard materials instead of paper. This piece includes stain samples on wood chips, a laminate sample piece, a found hinge and found rusty washers, nuts and screws. 6″ x 6” on wood cradled board. 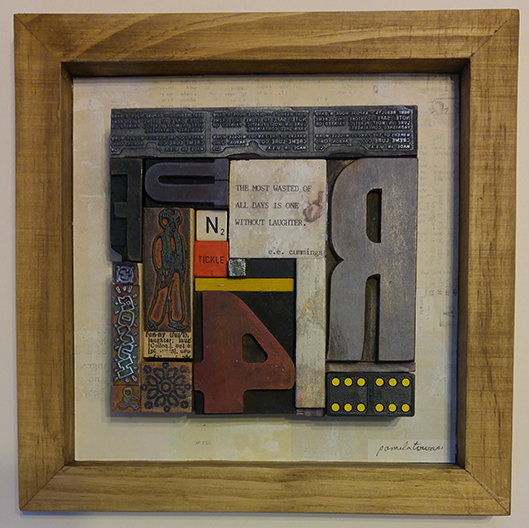 This mixed-media assemblage collage combines game pieces, vintage stamps, wood block and lead type pieces a stone sample and blocks together to pay tribute to laughter . . . the best medicine. 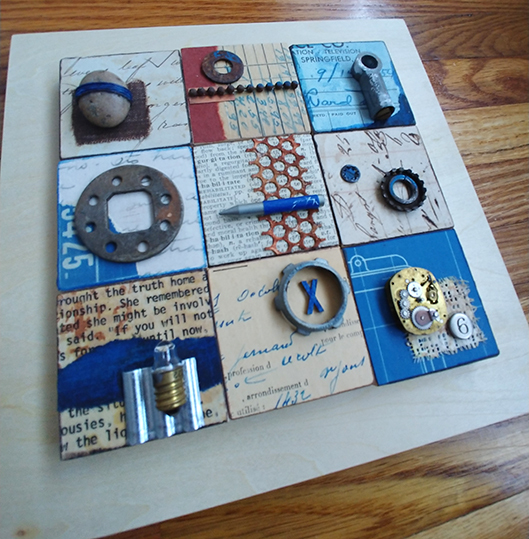 6″ x 6″ Assemblage in 10″ x 10″ frame. 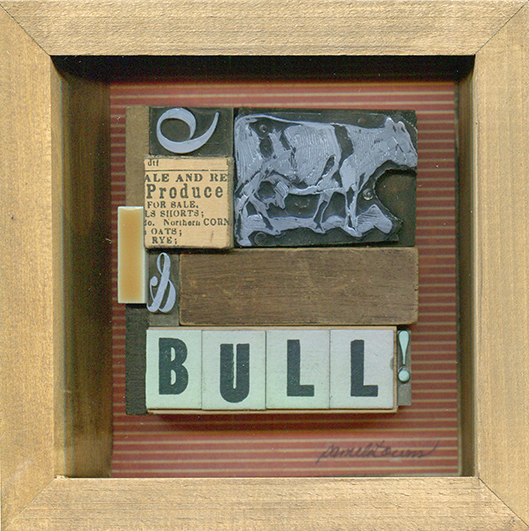 Three-dimensional mixed-media collage/assemblage with wood blocks, ceramic tile, vintage type and paper.